Pink Ink came out with this sweet little teddy bear set – he has SO many things to hold, and dressup parts! You could mask them together like I did, or fussycut them to layer together – or use the dies (see all links at the end of the post.) Birthday cards, love you cards – anything for kids, both girls and boys. 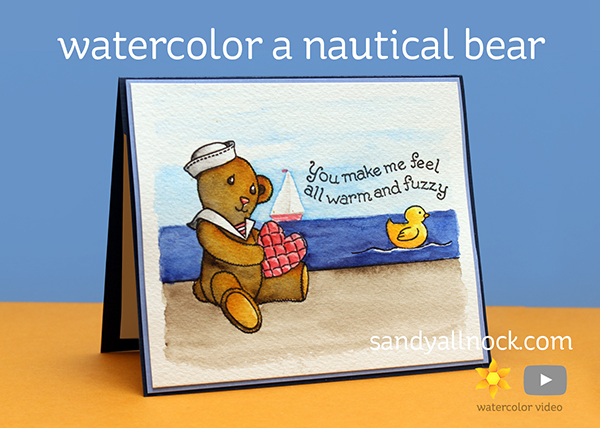 I chose to give him a little nautical collar and cap, and he’s holding a little heart….and his ducky buddy is floating out to sea! Watch the video below or click HERE to see it in HD on YouTube. Thank you, Sandy! I love the way you walked us through your process in such detail!